Everyone's saying a captive beluga whale stole the show when he photobombed a politician's TV speech. Connecticut Gov. 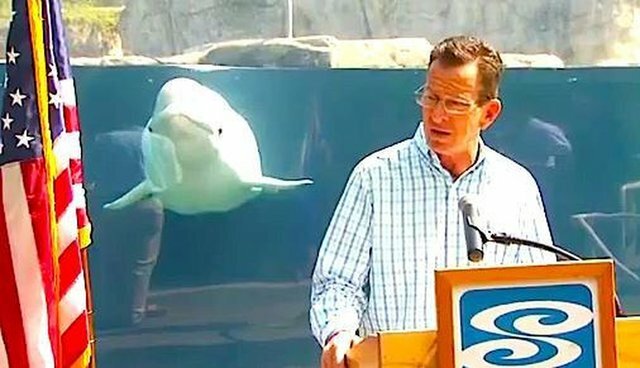 Dannel Malloy was talking about tourism at Mystic Aquarium on Wednesday, when a seemingly playful beluga whale appeared in the frame and watched his speech from the tank behind him. 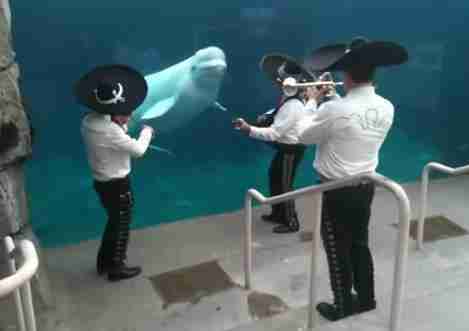 This is the same beluga whale, Juno, who has made the internet "aww" in the past. In 2012, he made waves when he showed interest in an artist's sketches; and in 2011, he seemed to be enjoying mariachi music. But a little thinking about this latest photobombing scenario turns the situation from whimsical to worrisome. Juno currently appears healthy, but beluga whales often do not live well in captivity. In one study, the mortality rate among baby belugas in captivity was 65 percent. And belugas who survive captivity long enough to become adults still don't live long, often dying before reaching 30, unlike their wild counterparts who can live to age 60. Furthermore, beluga whales show behaviors in captivity that get painted as cute rather than indicative or restlessness or frustration, and this isn't the first time people have glossed over the darker side of the story. A beluga at the same aquarium said to be making playful faces at children was actually showing anger and frustration, according to an expert. "The open mouth and posturing are typical of the way cetaceans express aggression and I've seen a lot in captivity in the very same circumstances. This poor animal is telling the kids: 'Get away'. It's a threat," Dr. Lori Marino, a beluga behavior specialist with The Kimmela Center, told The Dodo last year. "While belugas and other cetaceans in the wild make the same aggressive motions (open mouth, etc.) in this case, in my opinion, it is clearly due to the fact that these whales are crammed into this tank and have nowhere to go to escape the screaming kids poking at the glass," she said. Juno exhibited this same behavior in 2012, which mainstream news sources covered as adorable. In this latest beluga appearance, quickly going viral, Juno in the shot behind governor Malloy isn't really photobombing at all. He simply has nowhere else to go.